Getting ready to live without my sewing room for the next six months has required a fair bit of advance planning in the quilting/craft/general handwork department. I’ve decided to concentrate on things that do not require a sewing machine. So I’m keeping my collection of knitting needles and the supplies I need for hand quilting, hand piecing and applique out. I’m working on Heidi’s quilt (which has quite a way to go yet), and I’ve also been finishing a couple of other tops that are next in the queue to be hand quilted. And this is the top from my We Bee Canadian group this winter. And of course the never-ending Orange Peel quilt. There is one more (maybe two) that I’m going to try to get put together this week, and whatever doesn’t get done, isn’t going to get done…because the U-Haul leaves one week from today! I retired early and moved to a new community. I blog about my adventures as I explore a new lifestyle. I write about quilting, knitting and needlework, about learning to sew my own garments, adventures in the kitchen and in the garden, dancing, hiking, yoga...life is my playground! 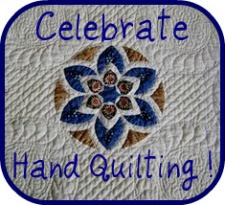 This entry was posted in Creativity, fabric, Hand Quilting, Knitting, Quilting, Quilts, Stitches and tagged knitting, moving, quilting, sewing, sewing by hand. Bookmark the permalink. It’s nice to know that your creative spirit is fuelled without electrical assistance. 🙂 That list should keep your hands moving! At the rate I sew that would keep me going for at least two years. Love your veggie bow ties. Good luck with the move.